In my weekly column, we take a long look at impact fantasy football rookies. I compare their performance to date against my original expectations of them. Let’s continue this 2014 version of the series by looking at one of the most overlooked rookie running backs in Branden Oliver. I will look at some of his college production against his performance versus the Broncos to dissect his dynasty value. I reviewed three of Oliver’s Buffalo college games; keep in mind that most of his opponents were against fellow Mid-American Conference teams. The first thing that I noticed was his height (5′ 6 1/2″) and his big, powerful legs. The back has quick feet, gets low in the hole, and possesses a highly developed center of gravity that keeps him upright when most runners would go down. Oliver uses this balance to squirt through small openings on the line of scrimmage while hiding behind the offensive line to gain a tactical advantage. It was difficult to see him at times, even on tape. The young back has a knack for delivering hits with his shoulder, but does not give his opponents much to hit on his own body. There were many times he slid off bigger hits, which frustrated many defenders. Oliver has decent vision which he uses to follow his blockers to get to the hole quickly. There are quite a few times, he does not see backside defenders flowing to him. The back does the little things well: fights for extra yardage, throws a good stiff-arm, keeps his legs churning, always falls forward, and runs to daylight. Oliver has a good jump cut combined with some burst that makes him dangerous in the open field. Defenders should watch his hips, because he tells stories with his shoulders that lie. He might be as quick-moving side to side as the back is running north and south. Don’t mistake that for an ability to create his own space though, Oliver cannot break a long run without his offensive line putting a hat on a hat. When he is the low man in the hole, it is hard stopping him. In the passing game, Oliver steps up to attack defenders trying to get to his quarterback. The young runner usually aims low against the blitzer and does a solid job in pass protection squaring his shoulders. As a target in the passing game, the back has a bad habit of letting the ball get into his body before securing it. Oliver needs to pluck the ball out of the air, but does a good job securing it. He does well in the screen game, using his quickness to make the first defender miss. Occasionally, the back received direct snaps near the goal line and in short yardage situations. Oliver was very effective in those situations. The young back reminds me of a less polished Maurice Jones-Drew with the junk in the trunk and strong leg drive that shorter backs do not have. Against the Broncos, I saw a back: that got overmatched. Oliver got contained early and often. There were no running lanes created by the offensive line and without them, the back fought for every inch he got. It did not help that the majority of the time, the young runner did not get low and let the defenders get into his body quickly. Oliver tried to break a number of plays outside, but does not have the speed or vision to beat the Denver defense. He had a few nice runs where he made quick jump cuts, or swatted people out of his way. Unfortunately, the runner got met in the backfield on the majority of his runs and could not create enough forward momentum to gain positive yardage. Oliver still lets the ball into his body in the passing game, but did make a nice catch between three defenders in the second half. The Chargers substituted him out on a lot of passing downs and during the two-minute drill to end the first half. He had a few glimpses of quickness and burst, but not enough to be confident with him as an every week starter. 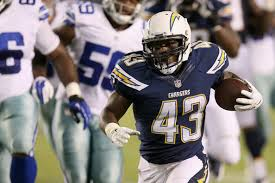 I think he has the skills to hold onto the Danny Woodhead role for the Chargers , but he will not hold off Ryan Matthews like some people suspected.